We’d love your help. Let us know what’s wrong with this preview of The Widow of the South by Robert Hicks. To ask other readers questions about The Widow of the South, please sign up. The pages of this debut novel are filled with death. Those already dead, the dying and the soon to be dead. The living are preoccupied with death, the dead and loss of loved ones. Nearly 10,000 men lost their lives on this battlefield that day and many were gravely injured. For the most part the story is told from the various perspectives of Carrie McGavock whose house was commandeered as a hospital, Sergeant Zachariah Cashwell of Arkansas, and Lieutenant Nathan Stiles of Ohio. Carrie and her husband, John, were real people and Carrie McGavock achieved legendary status. Mariah, a wonderful character in the book, was also a real person. The McGavock house known as Carnton is now a museum. After the war the McGavocks donated some of their land for the re-interment of the dead soldiers, and Carrie devoted much of her time to this project as well as to maintaining the cemetery. This is a little weird. The beginning is fantastic, opening with the Confederates on their way to Franklin where they meet the Union army and a bloody battle ensues. What I love about this is the alternating narratives. In the beginning, it isn't just Carrie, but also Zachariah's narrative on the Confederate side and a Union soldier gets his two cents in as well. When the battle is over, the book goes downhill for me. Carrie is more... gothic southern belle than widow of the south. She is obsess This is a little weird. The beginning is fantastic, opening with the Confederates on their way to Franklin where they meet the Union army and a bloody battle ensues. What I love about this is the alternating narratives. In the beginning, it isn't just Carrie, but also Zachariah's narrative on the Confederate side and a Union soldier gets his two cents in as well. When the battle is over, the book goes downhill for me. Carrie is more... gothic southern belle than widow of the south. She is obsessed with death to the point that she has worn nothing but black since she was sixteen and spends all her time mourning her three dead children while neglecting her live ones. Naturally, when over a thousand wounded Confederate soldiers are literally dumped on her porch, she is right in her element. She seems to thrive on the death and suffering around her and takes a strange and unexplained liking to Zachariah. This is where I really started getting "bugged." The basis for their strange, morbid romance is never made clear to me. Why do they love each other? What do they see? Despite their constant analyzing of each other and themselves and conversations about death, I never did understand the connection between the two of them. In the last quarter, Carrie tries to save the remains of the dead from a very angry, bitter landlord. Will she succeed? If so, at what cost? I had previously read and struggled with it. However, many reviewers of that book mentioned the superb quality of this one. They were right. Our book begins with two women walking through a cemetery and discussing the men buried there. Who are these women? What is so significant about this cemetery? Robert Hicks unveils the story of a Southern woman long forgotten in American history who desired to remember the men that had taken part in a bloody civil war and lost their lives because of it. This book has stayed with me for years. Today I am writing reviews for many of the best I've read in the last 15 years and for those I remember to this day. And I am a eclectic reader. For work and for pleasure I read about 15 or 20 books a week. This is one of my most remembered of the Civil War. So much so that I have highlighted Franklin TN for a visit. Addition to reaction above! 2016 experienced the three docent lead tours for Carnton Plantation, Carter House +Lotz House. 3 tours over two day This book has stayed with me for years. Today I am writing reviews for many of the best I've read in the last 15 years and for those I remember to this day. And I am a eclectic reader. For work and for pleasure I read about 15 or 20 books a week. Addition to reaction above! 2016 experienced the three docent lead tours for Carnton Plantation, Carter House +Lotz House. 3 tours over two days of two hours plus each. Only two of us as audience. These were the best tours I have experienced in long traveling years, including Europe and other hemisphere of lengthy days. November 30, 1864 starting just before sunset. Not in a field but around and in dwellings- a last pitch and desperate effort. At this very time development is pushing in and the center of the 117 acres becoming artefact for preservation. Too much to tell. Never omit the Carter House experience if you ever have a chance to do it. Another entire skeleton and a jaw bone found by a tourist near Lotz House went into Carrie's cemetery recently. In Robert Hicks's gorgeously written story of Carrie McGavock, a real-life woman whose plantation's proximity to the deadliest encounter of the Civil War, the Battle of Franklin, caused her home to be commandeered as a hospital and thrust her into importance as she cared for thousands of wounded and dying Confederate soldiers, we are given a searing look at our savagery against each other and the transformative effects it wreaks on our souls. Hicks does not take the easy path as a writer; alterna In Robert Hicks's gorgeously written story of Carrie McGavock, a real-life woman whose plantation's proximity to the deadliest encounter of the Civil War, the Battle of Franklin, caused her home to be commandeered as a hospital and thrust her into importance as she cared for thousands of wounded and dying Confederate soldiers, we are given a searing look at our savagery against each other and the transformative effects it wreaks on our souls. Hicks does not take the easy path as a writer; alternating his multifaceted story between the viewpoints of Carrie, a wounded soldier, Zachariah, whom she befriends, her slave and companion Mariah, as well as several other characters, he presents an all-encompassing portrait of the South's disintegration into the final hours and aftermath of the war - a time when the past is torn apart and the nation struggles to comprehend what has happened to it. Hicks's novel is based on research into actual historical events, and it shows: his careful attention to detail and the haunting, tragic circumstances his characters face are masterful. However, it is his ability to render the depths of their sundered hearts which proves most riveting. In Carrie, he has created an allegory of grief and resilience, a woman already crushed by loss who unexpectedly discovers purpose in the chaos and unimaginable suffering delivered at her door. She is not the archetype of the Southern belle so popularized in our minds. Neither feisty nor particularly gifted, she struggles for solace in a desolate existence, a nascent core within her awakened only by her unexpected rapport with the soldier Zachariah, who has survived the battle due to one reckless act that he himself doesn't understand. In Zachariah, Hicks depicts an unforgettable character: every downtrodden, aimless Southern man conscripted into duty without recognizing the price he will pay, someone who has never been much of anything, now swept up in circumstances that require him to rise above himself. Zachariah commands the narrative when he's present, as he overcomes his plight and embarks on a journey into the devastation and opportunism of a new world rising from the cinders. Likewise, Hicks embeds the soul of his story in the character of the slave Mariah, whose devotion to her troubled mistress renders her both enigmatic and courageous, the one person who realizes that the sudden emancipation of her people will not change her. Other characters such as Carrie's husband, John, are equally well-rendered, people whose gutted lives will either liberate or destroy them. Though not a simple or comforting read, particularly in its portrayal of the horrors of battle, "The Widow of the South" is a masterpiece of American literature, its searing truths about our human condition and the depths to which we can descend, as well as the seemingly-impossible heights we can achieve, lingering long after the final page is read. A touching story that addresses the aftermath of the Civil War in terms of the loss of so many young men for reasons that no longer seemed as compelling as they once did. It is told largely from the points of view of Carrie McGavock, the owner of a home that was turned into a hospital during the tragic battle at Franklin, Tennessee, and Zachariah Cashwell, a Confederate sergeant who was taken there after the battle. Most of the characters are very well developed. I was particularly taken by the A touching story that addresses the aftermath of the Civil War in terms of the loss of so many young men for reasons that no longer seemed as compelling as they once did. It is told largely from the points of view of Carrie McGavock, the owner of a home that was turned into a hospital during the tragic battle at Franklin, Tennessee, and Zachariah Cashwell, a Confederate sergeant who was taken there after the battle. Most of the characters are very well developed. I was particularly taken by the descriptions of this senseless battle and its immediate aftermath but the story did tend to lag a bit in the middle. Overall, it is still a good read and I recommend it for fans of southern literature and historical fiction. This review has been hidden because it contains spoilers. To view it, click here. May 7, 2008 - I went to the Carnton Plantation 2 years ago and have been wanting to read this book since then. The visit was amazing and seeing all of the headstones in the cemetary was unbelievable - 1500 (I believe) of them on the property all from one brief battle. The wood floors in the house still contain the bloodstains from this battle that lasted a short time ( a few hours I believe). The floors were completely destroyed by all of the injured and dying soldiers that were brought into thi May 7, 2008 - I went to the Carnton Plantation 2 years ago and have been wanting to read this book since then. The visit was amazing and seeing all of the headstones in the cemetary was unbelievable - 1500 (I believe) of them on the property all from one brief battle. The wood floors in the house still contain the bloodstains from this battle that lasted a short time ( a few hours I believe). The floors were completely destroyed by all of the injured and dying soldiers that were brought into this estate to be cared from by the owners. What a shock it must have been for them to realize that this deadly battle was going to be fought right off of their front porch. The tour guide made the history of the place come alive, and I can't wait to see how the book compares to my visit! May 12, 2008 - I finished the book while on a trip to Tennessee this past weekend. Having been to the plantation really made it come alive for me. I would love to go back to the house again now that I have read the book. I did go to the Carter house on my trip and learned more about the Battle of Franklin. It lasted only 5 hours and in all about 9,000 men died (union and confederate)- more than any other battle of the Civil War! This house really helped me with my understanding of the book too. The Carnton Plantation was off to the side of the battle where as the Carter House was in the MIDDLE OF THE BATTLE FIELD!!!!! Thie Carter House is the most heavily bullet-damaged house still standing today from the Civil War! After Carrie McGavock beat a wounded soldier with a crutch, I couldn't bring myself to finish this book. If you want a good Battle of Franklin read, pick up one of Howard Bahr's books. The Black Flower is his best. 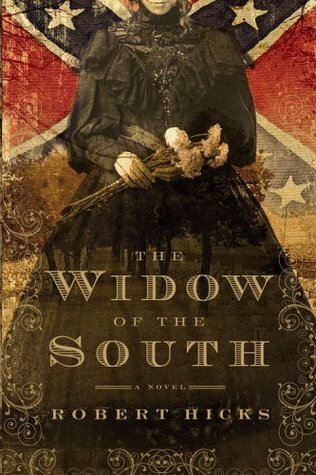 Widow of the south takes place in Franklin, Tennessee during the end of the civil war, and is based on the life of Carrie McGovak. The book tells the story of an important, but almost forgotten piece of US history. Since there were a lot of gaps in the protagonist's known life, the author has given her a number of attributes (in order to add drama) that may or may not be true (and may or may not be really believable and may or may not cause McGovak to roll over in her grave). McGovak's home is m Widow of the south takes place in Franklin, Tennessee during the end of the civil war, and is based on the life of Carrie McGovak. The book tells the story of an important, but almost forgotten piece of US history. Since there were a lot of gaps in the protagonist's known life, the author has given her a number of attributes (in order to add drama) that may or may not be true (and may or may not be really believable and may or may not cause McGovak to roll over in her grave). McGovak's home is made into a hospital and she subsequently becomes a nurse to wounded soldiers during this short, but bloody battle of the civil war. After the war, she takes steps to create a cemetery for 1500 soldiers who had been hastily buried in a mass grave in a nearby field. I have been to this town a few times and had no idea of it's history. Having read the book, I think I will have to make a road trip and visit her former home, which is now a museum. The soldiers' blood is said to stain the floors. Pros: I think the story is an important one and has since caused much-needed recognition to both the heroine and the lost soldiers from the battle. It is an interesting piece of history that most people wouldn't know. Cons: The kinda-romance between her and Zachariah was totally unnecessary, in my opinion. I think it was inserted in an attempt to make the story less dry and throw some romance into the mix. I seriously doubt that it ever happened. The story was often disjointed and hard to follow. It could have flowed a lot better and been a bit shorter. There are a lot of unnecessary elements that could be edited out without detracting from the story. Historical fiction - based on the true story of Carrie McGavock whose plantation home was used as a hospital during the battle of Franklin between the Union and Confederate armies. Interesting, but sometimes a bit obtuse I thought. Wasn't very crazy about the dialog which sometimes seemed confusing, as if the characters themselves didn't quite know what they thought or meant. Did like the character of Mariah, Carrie's slave who had been with her since childhood. Interesting to see their relation Historical fiction - based on the true story of Carrie McGavock whose plantation home was used as a hospital during the battle of Franklin between the Union and Confederate armies. Interesting, but sometimes a bit obtuse I thought. Wasn't very crazy about the dialog which sometimes seemed confusing, as if the characters themselves didn't quite know what they thought or meant. Did like the character of Mariah, Carrie's slave who had been with her since childhood. Interesting to see their relationship, especially after the War ended and Mariah stayed on with Carrie. Didn't care as much about the mental love affair between Carrie and Zachariah, one of the soldiers she helps heal. I lived for several years in middle Tennessee and actually visited Stone River Battlefield for a candlelight cemetery tour ... listening to readings of actual letters written by soldiers buried there. I even lived in Franklin, TN and drove past the Carnton Plantation on a regular basis, never knowing the story of Carrie McGavock until reading this book. Carrie was a true heroine of the Civil War and her story should heard so that everyone can recognize the bravery and strength she had. Carrie's I lived for several years in middle Tennessee and actually visited Stone River Battlefield for a candlelight cemetery tour ... listening to readings of actual letters written by soldiers buried there. I even lived in Franklin, TN and drove past the Carnton Plantation on a regular basis, never knowing the story of Carrie McGavock until reading this book. Carrie was a true heroine of the Civil War and her story should heard so that everyone can recognize the bravery and strength she had. Carrie's days were spent mourning the lives of her children who had succumbed to illness when her town became the scene of a major Civil War battle. Her home was taken over by the Confederate Army and used for a makeshift hospital and her land became the burial grounds for the men who fought and died that day. 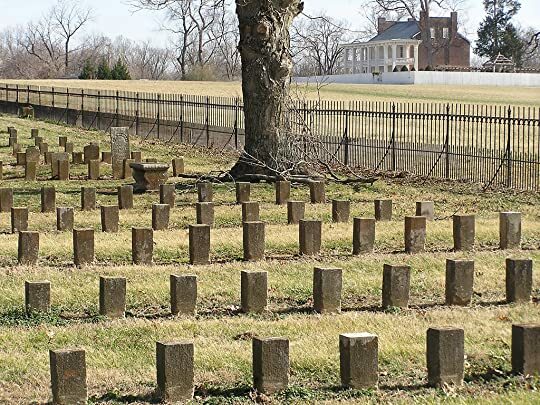 When a neighboring landowner wanted to plow under graves of soldiers on his own land, Carrie had the corpses moved to her property and worked to identify and record those names of those buried, preserving the honor of those whose lives were lost. I'm not sure what I expected with this novel. It wasn't what I got, that much I know. I had to listen to the prologue about three times before I got into the swing of the story. Once that was achieved, I had no further problems in that regards. The book is based on the true story of Carrie McGavock whose home was turned into a hospital during the battle at Franklin, Tennessee in November 1864. After the war was over, Carrie & her husband donated some of their land as a cemetary for the men wh I'm not sure what I expected with this novel. It wasn't what I got, that much I know. The book is based on the true story of Carrie McGavock whose home was turned into a hospital during the battle at Franklin, Tennessee in November 1864. After the war was over, Carrie & her husband donated some of their land as a cemetary for the men who lost their lives in the bloody battle. Bodies were exhumed, identified where possible, and reburied in individual plots in the McGavoc Cemetary. I don't know how accurate Robert Hicks was in portraying this woman and the events surrounding the completion of the cemetary. I suspect that the only factual parts were the battle at Franklin, the use of Carnton (the McGavock home) as a hospital and the existance of the cemetary. I could find very little about Carrie on the internet other than the occasional mention. At the beginning of the book, Robert Hicks painted her as a rather weak woman. She isolated herself from the world as she secluded herself in her room, mourning the death of three of her children. I wondered how this woman could be the same woman who would see the horrors of war spilling over in her own home, and who would assist in caring for these dying boys and men. I wondered if Hicks was doing her memory a disservice. Perhaps he was striving for the contrast between Carrie before the war, and Carrie because of the war. Perhaps he wanted to demonstrate that she pulled an iron strength from deep within her to care for the dying, that being the pivotal thing that made her the strong woman she must have been. There was an unlikely romance that had to be purely fiction. However, it served to be the crux of the issue between wanting to live or wanting to die. The second half of the book examined this issue in detail. In fact, I rather tired of it, but I perserved. It picked up towards the end when the idea of reburying the soldiers at Carnton. I do know that Hicks' portrayal of the exhumation, identification, and reburial of the bodies was not accurate to what really happened. Unfortunately, some audiobooks leave off the author's note so I don't know his reasoning for rewriting history. Wonderful melding of fact and fiction, and a strangely beautiful story. This book was an absolutely beautiful rendering of the emotional aftermath of one of the most destructive battles of the Civil War. Any time you combine historical fiction with the Civil War, I HAVE to read it. Now, I haven't read much about the Battle of Franklin, so I can't attest to the historical accuracy here. But I found the depiction of a group of people trying to comprehend & process & deal with such death and destruction to be quite accurate. For the first time (at least on this This book was an absolutely beautiful rendering of the emotional aftermath of one of the most destructive battles of the Civil War. Any time you combine historical fiction with the Civil War, I HAVE to read it. Now, I haven't read much about the Battle of Franklin, so I can't attest to the historical accuracy here. But I found the depiction of a group of people trying to comprehend & process & deal with such death and destruction to be quite accurate. For the first time (at least on this large of scale), the country was trying to come to terms with what a "good death" meant for the thousands & thousands of soldiers who died on this & other battlefields. (See: Drew Gilpin Faust's This Republic of Suffering). And that's why I enjoyed Hicks' portrayal of Carrie so much. Reading through this woman's journey from all-consuming depression to what she viewed as her ultimate destiny was enthralling. I will admit that even though this story wasn't what I was expecting (although, I'm still not sure what I was, in fact, expecting), I found this book riveting & difficult to put down. The only thing keeping this from being 5 stars is that it used a little too much "stream-of-consciousness" and got a little too odd at times for me. I can't say it took away from the book really, it was just that sometimes, I found myself having to re-read passages to see where the heck a character had been going with a thought. But really, this too is pretty accurate, so I can't be too upset about it. I was so bored I went upstairs to wake the baby for something to do. I really thought that this book was going to be a whole lot better than it was. THE WIDOW OF THE SOUTH is an excellent, breath-taking and fascinating read. I can’t help but say that this book deeply moved me. The words, Carnton, Franklin, Tennessee, will never have the same meaning to me now that I’ve read this amazing novel. In his debut novel, Robert Hicks does a masterful job in telling us a true story of historical significance, written with the style of a seasoned author. After reading My Name is Mary Sutter I’ve become very interesting in reading novels about the Amer THE WIDOW OF THE SOUTH is an excellent, breath-taking and fascinating read. I can’t help but say that this book deeply moved me. The words, Carnton, Franklin, Tennessee, will never have the same meaning to me now that I’ve read this amazing novel. In his debut novel, Robert Hicks does a masterful job in telling us a true story of historical significance, written with the style of a seasoned author. After reading My Name is Mary Sutter I’ve become very interesting in reading novels about the American Civil War. Here, again I’m not disappointing – it was even more poignant. There is enough detail to intrigue someone interested in this particular era and events, with ample compelling and thoughtful human interest. The vivid imagery is very powerful. Who would have thought someone could write about the utter carnage of the Civil War using such lyrical language? Hicks includes many sensitive, thoughtful passages about death and war. What totally drew me into this story from the start is that the author brings eyewitness immediacy to this story by alternatively writing in the first person, giving us the thoughts of a soldier going into battle, facing almost certain death. The main characters, Carrie, Mariah and Zachariah bring so much life - and hope - to a story about war. It was deeply touching to see the transformation of the central characters (Carrie & Zachariah) from wanting nothing to do with living and suddenly wanting to embrace life (and not for the obvious reason). One of my favorite books of the year. While this is a novel, it was superbly researched and part of the book is sheer history. From Publisher's Weekly: Hicks's big historical first novel, based on true events in his hometown, follows the saga of Carrie McGavock, a lonely Confederate wife who finds purpose transforming her Tennessee plantation into a hospital and cemetery during the Civil War. Carrie is mourning the death of several of her children, and, in the absence of her husband, has left the One of my favorite books of the year. While this is a novel, it was superbly researched and part of the book is sheer history. Widow of the South is the fictionalized story of Carrie McGavock, who cared for, housed, and eventually buried nearly all the 1500 lost souls who fought (near her home) for the South during the Civil War. 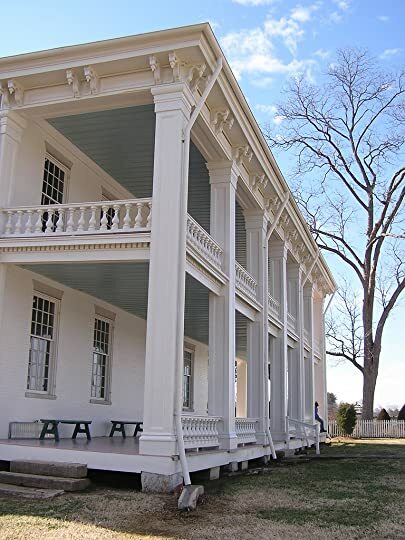 Carnton, the large mansion owned by Carrie and her husband, became a makeshift hospital for the men torn apart, both emotionally and physically, during one of the deadliest historical battles, The Battle of Franklin (Tennessee) on November 30, 1864. This story attempts to interweave historical b Widow of the South is the fictionalized story of Carrie McGavock, who cared for, housed, and eventually buried nearly all the 1500 lost souls who fought (near her home) for the South during the Civil War. Carnton, the large mansion owned by Carrie and her husband, became a makeshift hospital for the men torn apart, both emotionally and physically, during one of the deadliest historical battles, The Battle of Franklin (Tennessee) on November 30, 1864. This story attempts to interweave historical battle facts around the woman who cared enough to find a proper burial site for these men. A fictional story of love never-realized, bravery, and horror war stories, misses the mark, however. Secondary characters are not developed enough to make it a story worth caring about. Only until the epilogue and author's note at the end of the story does this reader feel as though the time spent reading was worth the effort. The long string of different voices does nothing to enhance the story or the characters. They often spoke with the same voice, which was oddly confusing. What an addicting read. A little hard to follow at times, but you're really so enthralled the entire time the difficult bits just fly by. Though the novel bounces back and forth to different perspectives, it's truly Carrie McGavock that carries the novel, just as she carried so much during and after the Battle of Franklin. An amazingly strong woman, I wonder how much was her real character and how much was added upon by Robert Hicks. As for her relationship with Zachariah, it seemed at times unne What an addicting read. A little hard to follow at times, but you're really so enthralled the entire time the difficult bits just fly by. Though the novel bounces back and forth to different perspectives, it's truly Carrie McGavock that carries the novel, just as she carried so much during and after the Battle of Franklin. An amazingly strong woman, I wonder how much was her real character and how much was added upon by Robert Hicks. As for her relationship with Zachariah, it seemed at times unneccessary and would drag the novel down. Hick's writing, though, makes up for any character flaws in the novel. I felt that his descriptions and narratives really brought in the nature and attitude of the South near the end of the Civil War. He doesn't vilify anyone in the novel (i.e. Confederates, Union soldiers, blacks, ideals of the south) which is a relief for any reader wanting to read a (relatively) hopeful story of the War.